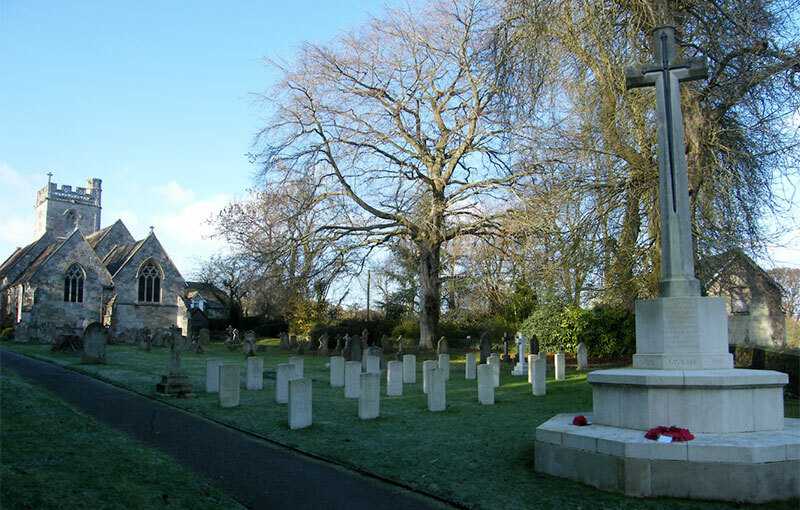 There follows a list of war graves located at St. Georges church in Fovant. Visitors to St. Georges can find a copy of a booklet near the entrance to the church that lists the location of all graves in the churchyard. The number prefixing each name in the list below is the location of the grave as listed in the booklet. 0615.05 ALLPORT W. 1890-1916 war grave 4060 PRIVATE 2ND BN LONDON REGT.F.FUS. 20TH NOVEMBER 1916. OH! THAT THIS WORLD COULD BE A HEAVEN, COULD I HEAR YOUR VOICE AGAIN. 0507.06 ANDREWS J.E. 28 1891-1919 war Grave 2049 CORPORAL AUSTRALIAN FIELD ARTILLERY, 2nd FEBRUARY 1919, AGE 28. PEACE, PERFECT PEACE. 0615.07 ANSELL A.C. 1890-1916 war grave 6603 RIFLEMAN LONDON RIFLE BRIGADE, 18TH OCTOBER 1916. 0507.03 ASHLEY G. 31 1887-1918 war Grave 49214 PRIVATE DEVONSHIRE REGIMENT, 6th NOVEMBER 1918, AGE 31. GONE BUT NOT FORGOTTEN. 0506.03 BATTEN N. 19 1899-1918 war Grave 62066 PRIVATE 43rd BN AUSTRALIAN INF. 10th NOVEMBER 1918 AGE 19. ALL THAT IT MEANT TO LOSE HIM ONLY OUR SAD HEARTS KNOW. MOTHER. 0506.02 BROWN T.H. 20 1898-1918 war Grave 14491 GUNNER AUSTRALIAN FIELD ARTILLERY 10th NOVEMBER 1918 AGE 20. DEARLY LOVED SON OF MARGARET AND THE LATE HUGH DONALD BROWN. AT REST. 0505.02 BURDEN R.E. 25 1894-1919 war Grave 4449 PRIVATE 46th BATT. AUST INF. AGE 25. WE HAVE LOST AND HEAVEN HAS GAINED ONE OF THE BEST THE WORLD CONTAINED. 0616.10 BURNS G. 26 1891-1917 war grave 34 CORPORAL AUST ARMY POSTAL CORPS, 17TH OCTOBER 1917, AGE 26. IN MEMORY OF THE DEAR FRIEND OF T.SCOTT & AGNES CULLEN, N.S.W. 0616.03 CHAPPEL N. 27 1890-1917 war grave 1844 PRIVATE 4TH AUSTRALIAN PIONEERS, 7TH MAY 1917, AGE 27. 0504.01 COBBING J.H.E. 25 1894-1919 war Grave 235 PRIVATE AUST MACHINE GUN CORPS. 0617.02 COLEMAN W. 34 1883-1917 war grave 3284 PRIVATE 36TH BN AUSTRALIAN INF. 20TH NOVEMBER 1917, AGE 34. 0616.09 CURNOW D. 30 1887-1917 war grave 2212 PRIVATE 5TH AUSTRALIAN PIONEERS. 6TH SEPTEMBER 1917, AGE 30. 0616.04 DARBY R.C. 19 1899-1918 war grave 7427 PRIVATE 28TH BN AUSTRALIAN INF. 13TH AUGUST 1918, AGE 19. BLESSED ARE THE DEAD WHICH DIE IN THE LORD. 0507.05 DUGGAN P.J. 34 1885-1919 war Grave 1733 DRIVER AUSTRALIAN FIELD ARTILLERY 29th JANUARY 1919, AGE 34, AS HE LIVED SO HE DIED OUR ANZAC HERO. 0617.05 EDGE R.R. 45 1873-1918 war grave 6318 PRIVATE 27TH BN AUSTRALIAN INF. 4TH APRIL 1918, AGE 45. 0615.13 FRAMPTON H.F. 1890-1916 war grave 4849 RIFLEMAN QUEEN VICTORIA RIFLES. 6TH MARCH 1916. 0617.03 GARDNER F.L. 26 1892-1918 war grave 7179 PRIVATE 17TH BN AUSTRALIAN INF, 7TH MARCH 1918, AGE 26. IN MEMORY OF THE DEARLY LOVED SON OF MR & MRS A.L.GARDNER OF BONDI. 0502.03 GRAY A.E. 29 1889-1918 war Grave 2nd LIEUT AUSTRALIAN REINFORCEMENT. DEARLY BELOVED HUSBAND OF ESME. LOVING FATHER OF KEITH. 0616.07 GREIG A.T. 22 1895-1917 war grave 3953 PRIVATE 1ST AUSTRALIAN PIONEERS, 22ND JULY 1917, AGE 22. 0507.02 HANDYSIDE G. 1890-1918 war Grave 306591 ROYAL AIR FORCE, 3rd NOVEMBER 1918. 0502.04 HILL H.E. 29 1889-1918 war Grave 2004 PRIVATE 60th BN AUSTRALIAN INF. A THOUGHT FROM HIS LOVED ONES IN AUSTRALIA IN MEMORY OF HECTOR ERNEST HILL, SADLY MISSED. DEATH TAKES THE LOVED ONE FROM OUR HOME, BUT NEVER FROM OUR HEARTS. 0508.03 JONES T. 32 1886-1918 war grave 5403 PRIVATE 7TH BN AUSTRALIAN INF. 2ND NOVEMBER 1918 AGED 32. 0508.04 JONES G.E. 29 1889-1918 war grave 4031 PRIVATE 51ST BN AUSTRALIAN INF. 4TH NOVEMBER 1918 AGED 29. GREATER LOVE HATH NO MAN THAN TO LAY DOWN HIS LIFE FOR HIS FRIENDS. 0503.06 LEE William Edward George 1910-1940 war Grave Named on the War Memorial inside the Church. 0503.01 MANN E.G. 1882-1919 war Grave 2442A PRIVATE 4th AUSTRALIAN PIONEERS. AT REST, HIS DUTY DONE. 0615.08 MCANDREW S.W. 1890-1916 war grave 6603 RIFLEMAN POST OFFICE RIFLES. 4TH OCTOBER 1916. 0501.01 MCILRICK E.R. 20 1898-1918 war Grave 54715 PRIVATE 35th BN AUSTRALIAN INFANTRY. NOTHING IN MY HAND I BRING, SIMPLY TO THY CROSS I CLING. 0505.05 OLIVER W. 28 1892-1920 war Grave 19332 BTY PMR SGT AUSTRALIAN FIELD ARTILLERY. AGE 28. GREATER LOVE HATH NO MAN THAN THIS. A SOLDIER AND MAN. 0615.09 PATTON W. 1890-1916 war grave 6595 RIFLEMAN POST OFFICE RIFLES. 1ST SEPTEMBER 1916. 0508.05 SHARPE K.C. 27 1891-1918 war grave 2240 PRIVATE 3RD AUSTRALIAN PIONEERS. 8TH NOVEMBER 1918 AGED 27. TILL WE MEET AGAIN. 0508.01 SHAW H. 1890-1918 war grave 55600 PRIVATE HAMPSHIRE REGIMENT. 15TH SEPTEMBER 1918. 0506.06 SHEARING T.E. 25 1894-1919 war Grave 927 PRIVATE AUSTRALIAN ARMY MEDICAL CORPS FORMERLY 10th BN AUSTRALIAN INFANTRY. 26th NOVEMBER 1919. AGE 25. THE DEARLY BELOVED SON OF MR & MRS SHEARING OF BAGDAD TASMANIA. 0616.05 SIMPSON R. 41 1876-1917 war grave 2667 4TH AUSTRALIAN PIONEERS. 16TH MAY 1917, AGE 41. HE DIED FOR TRUTH AND FREEDOM. 0505.04 SYMONS W.H. 24 1896-1920 war Grave 6895 PRIVATE 27th BN AUST. INF. AGE 24. FOREVER WITH THE LORD. IN LOVING MEMORY OF OUR DEAR SON. 0501.02 TRENEAR P.J. 19 1899-1918 war Grave 54772 PRIVATE 35th BN AUSTRALIAN INFANTRY. THE LORD GAVE AND THE LORD HATH TAKEN AWAY. THE LORD BE WITH HIM. 6.12 0501.04 WEBB H.E. 28 1890-1918 war Grave 773 PRIVATE. HAVE MERCY UPON HIM O LORD, AND LET THY LIGHT SHINE UPON HIM. 0615.12 WEIGHT A.L. 27 1889-1916 war grave 4535 LANCE CPL QUEEN VICTORIA RIFLES. 6TH MARCH 1916, AGED 27. SAFE IN THE ARMS OF JESUS. 0502.02 WHITTON R.A. 38 1880-1918 war Grave 18994 PRIVATE. HE LIVES WITH US IN MEMORY STILL & WILL FOR EVER MORE. 0508.02 WOODGER J. 32 1886-1918 war grave 2823 GUNNER AUST FIELD ARTILLERY. 31ST OCTOBER 1918 AGED 32. 0617.04 WRIGHT J. 22 1896-1918 war grave 1992 CORPORAL 41ST BN AUSTRALIAN INF, 28TH MARCH 1918, AGE 22. HE GAVE HIS LIFE FOR THE SAKE OF HIS HOME AND COUNTRY.